In the middle of the small, old-fashioned town of Darmstadt, surrounded by quiet, dignified streets, belonging to a time long gone by, stands the New Palace. It was the house Princess Alice of Great Britain and Ireland," the second daughter of Queen Victoria, wife of Prince Louis of Hesse-Darmstadt, had built for herself when her first home proved too small for her rapidly increasing family. For a town house the New Palace had a lovely garden, the site having originally been that of the Botanical Gardens. It was built according to the Princess's own taste and was made by its owner as much like an English house as possible. In that palace the future Empress was born. 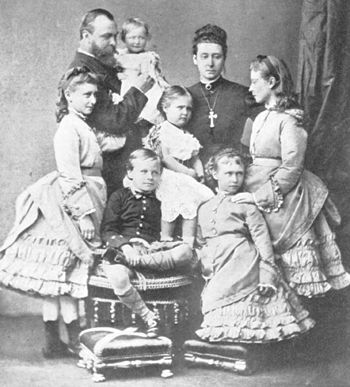 Above: ClockwiseElizabeth, Grand Duke Louis with May in his arms, Alix, Alice, Victoria; seated, Ernest Louis; kneeling, Irene. 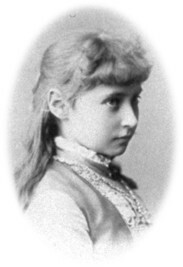 The Princess Alice went to Germany as a very young girl. She was intensely English; her attachment to her own country never wavered. She married and left England shortly after the death of her father, the Prince Consort, having been the Queen's support and comfort during the time of the Prince's illness. She was always thinking of England, and she built and furnished her new home to give her memories of the home she had left. "I can't fancy I am in Germany, the house and all its arrangements being so English," the Princess wrote to the Queen on March 20th, 1866. All the family portraits were there, from those of King George III and his family to numerous pictures of the Queen, the Prince Consort, and of all her brothers and sisters. Sketches of Windsor, Balmoral, and of other places she had loved in her youth were treasured by the Princess at Darmstadt, and fostered in her children that love and admiration for England that was so strong a trait in all of them. Life in the Palace was organized on English lines, and was so carried on after the Princess's death. Though Princess Alice's life was so short - she died on December 14th, 1878, at the age of thirty-five - it was a full one. She saw many things, and judged and analysed them with the wonderfully clear brain on which her contemporaries remark. Young though she was at the time of his death, she had been her father's favorite companion. Her warm heart, guided by her practical mind, gave a new impulse to all the social work of the small country that became hers by marriage. Even now most of its charitable institutions bear her name. The Grand Duchess Alice founded hospitals and women's guilds. She patronized women's unions, when, for the first time in Germany, the question of posts in government offices being filled by women was raised. She was a good judge of men, and had the gift of choosing the right people to carry out her schemes. During the wars of 1866 and 1870 she took an active part in the Red Cross work of Hesse. She founded new hospitals and perfected the arrangements of old ones. With the help of Queen Victoria, she had the newest and best appliances sent from England. "Life is meant for work and not for pleasure," the Princess wrote to the Queen (August 29th, 1866); but in reality it was in work that her active mind found most pleasure. The war of 1866 created much bitter feeling in Germany, as civil war always does. Hesse sided with Austria against Prussia, and Prince Louis of Hesse was in the field with the Hessian army. The Prussian side won, and Prussian troops entered Darmstadt. This was a bitter moment for the Princess, then helpless in the Darmstadt palace, where her third daughter, Princess Irene, had just been born. As a result of the war, Hesse lost a large part of its territory, the main part of Oberhessen going to Prussia. This has never been forgotten by the population, and a feeling of coldness towards Prussia can be noticed to this day. The personal relations of the Grand Ducal family with that of the then Crown Princess of Prussia (the Empress Frederick) did not suffer, however, and the two sisters were always devoted to each other. Princess Alice was a woman of many interests and wide friendships. Among her friends was the great philosopher David Strauss, who dedicated to her his work on Voltaire. Intellectual pursuits were always more congenial to her than worldly pleasures, though she had great charm of manner and as a public duty scrupulously took her share in the society life of Darmstadt. Princess Alice's private life was devoted to her husband and their seven children. In her letters to Queen Victoria she continually mentions their little ailments, their quaint sayings, and the trivial things that a mother loves to note. She directed their education, studied their characters, and guided each one individually. The terrible death of her baby boy, Prince Frederick, who was killed by a fall from a window under her very eyes (May 29th, 1873), gave her a moral and physical shock from which she never really recovered. But she braced herself for the sake of her other children; she wrote to Queen Victoria: "God is very merciful in letting time temper the sharpness of one's grief and letting sorrow find its natural place in our hearts without withdrawing us from life." The little Princess, whose birth was recorded on June 6th, 1872, and who was destined to be one of the most tragic figures of history, was christened, on her parents' wedding day, July 1st, Victoria Alix Helena Louise Beatrice, her godparents being the Prince and Princess of Wales (King Edward VII and Queen Alexandra), the Tsarevich (Alexander III) and Tsarevna - Princess Alix's future parents-in-law, Princess Beatrice of Great Britain, the Duchess of Cambridge, and the Landgravine of Hesse. Baby is like Ella, only smaller features, and still darker eyes with very black lashes, and reddish brown hair. She is a sweet, merry little person, always laughing and a dimple in one cheek, just like Ernie (August 14th, 1872). Mention of the Princess Alix's beauty as a baby is made in several later letters. On the occasion of the christening of her little sister, Princess Marie (May), her mother writes to the Queen: " Sunny in pink was immensely admired" July 13 th, 1874. "Sunny is the picture of robust health September 1st, 1878. The Princesses Victoria and Ella (Elizabeth) were already in the schoolroom when their sister was born, and Princess Irene was by herself, between nursery and schoolroom. Princess Alix's babyhood was thus spent mostly with her brother and Princess May. This beloved elder brother, the originator of all their games, was the object of her deep admiration, and the intimacy of childhood remained with them all their lives. Life in both nursery and schoolroom followed definite rules, laid down by the children's mother, and on the same simple lines as those on which Queen Victoria's children had been brought up. Their father did not become reigning Grand Duke till the death of his uncle in 1877. Both Prince and Princess Louis gave much of their income to charity, and the building of the New Palace had swallowed much of the Princess's dowry, so that, before the Grand Duke's accession, they were far from rich. Their children were brought up in accordance with old-fashioned English ideas of hygiene, which were, at that time, far ahead of those in Germany. Their dress was simple and their fare of the plainest; indeed they kept all their lives hated memories of rice puddings and baked apples in endless succession. The nurseries were large, lofty rooms, very plainly furnished. 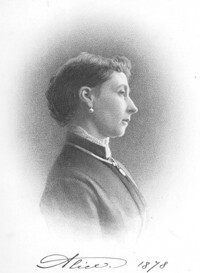 Mrs. Mary Anne Orchard, " Orchie" to the children, ruled the nursery. She was the ideal head nurse, sensible, quiet, enforcing obedience, not disdaining punishment, but kind though firm. She gave the children that excellent nursery training which leaves a stamp for life. Mrs. Orchard had fixed hours for everything ; and the children's day was strictly divided in such a way as to allow them to take advantage of every hour that their mother could spare for them. On the same floor as the nurseries were the Grand Duchess's rooms, and there the little Princesses brought their toys and played while their mother wrote or read. Toys were simple in those days compared with the elaborate ones that modern children have. Princess Alix never cared for dolls; they were not "real" enough; she preferred animals that responded to caresses, and she delighted in games. Sometimes all the old boxes containing their mother's early wardrobe were brought out for dressing up. The children strutted down the long corridors in crinolines, and played at being great ladies, or characters from fairy tales, dressed in bright stuffs and Indian shawls, which their grandmother, Queen Victoria, could not have imagined being put to such a use. The Grand Duke was not able to be much with his children, but their rare games with him were a delight, and Princess Alix's earliest recollections were of romps in which her big burly soldier father joined. The children were full of fun and mischief. They did not always drive decorously in their small pony carriage, with a liveried footman at the pony's head. They sometimes escaped from their nurse's vigilance, and once Princess Alix paid dearly for such an escapade. The children were staying at Darmstadt just after their mother's death and were chasing one another in the garden. Princess Irene and Prince Ernest ran over some high forcing frames, carefully treading only on the stone. Princess Alix - who was six at the time-followed, but tried to run over the glass panes. She crashed through, and was badly cut by the glass, beating on her legs the scars of this adventure all her life. Winters were spent at Darmstadt, summers mostly at the castles of Kranichstein or Seeheim. It is easy to picture the band of merry, high-spirited children romping in the suites of old fashioned rooms at Kranichstein, racing in the park under the oaks, standing in deep admiration before the ancient winding staircase on which the picture of a lifesized stag commemorated the spot where a real stag once sought refuge from a Landgrave of old days. Christmas was celebrated partly in the English and partly in the German way, and was a family feast in which all the household shared. A huge Christmas tree stood in the ballroom, its branches laden with candles, apples, gilt nuts, pink quince sausages, and all kinds of treasures. Round it were tables with gifts for all the members of the family. The servants came in and the Grand Duchess gave them their presents. Then followed a family Christmas dinner, at which the traditional German goose was followed by real English plum pudding and mince pies sent from England. The poor were not forgotten, and Princess Alice had gifts sent to all the hospitals. Later, the Empress continued the same Christmas customs in Russia. Every year, much to the children's delight, the whole family went to England, staying at Windsor Castle, Osborne or Balmoral, according to Queen Victoria's residence at the moment. The Queen was adored by all her grandchildren. She was always a fond grandmother, and did not apply to them the strict rules that had governed her own children. In England the little Prince and Princesses of Hesse met crowds of cousins, including the children of the Prince and Princess of Wales (King Edward VII) and those of Princess Christian. With this merry band, they played about Windsor, wandered in the grounds at Balmoral and Osborne, visited pet little shops and had their own special friends among the Queen's retainers. They went round to see these old friends every time they came over, and the visit to "the merchants," by which name a small shop between Abergeldie and Balmoral was known to them, was never missed. The "merchants" sold sweets, notepaper, and other small things, and the children would come back from their expedition, laden with wonderful purchases, to which the kindly "merchants," an old lady and her sister, would generally add a sweet something. The great delight of the young Princesses at being initiated by their old friend and her sister into the secrets of scone-baking was remembered all their lives, and the tales of these adventures, recounted in later days, filled the hearts of the Imperial Russian children with longing envy. "Grandmamma in England" was, to the childish imagination of Princess Alix, a combination of a very august person and of a Santa Claus. When she returned from England Princess Alix would talk about her stay for weeks and would begin to look forward to the next year's visit. During the winter at Darmstadt, Princess Alice used often to take her children with her to hospitals and charitable institutions. They thus learned from an early age to enjoy giving pleasure to others, and Princess Alix, when quite tiny, would take flowers to hospitals on her mother's behalf. Occasionally other children came to play with the small Princesses at Darmstadt, and there were children's parties, but these Princess Alix did not much enjoy. Her constitutional shyness was beginning to show itself, and she always kept in the background. The friend of her babyhood, who remained her most intimate companion till her marriage, was Fraulein Toni Becker. She and Toni played together as babies, and later shared dancing and gymnastic lessons. As they grew older, their intimacy grew also, till, when Princess Alix came out, Toni was at the Palace almost every day. In 1877, the death of his uncle, the Grand Duke Louis, made Princess Alix's father reigning Grand Duke of Hesse. This event produced no change in the children's lives, but for the Grand Duchess Alice it meant a great increase of public duties, and consequently a considerable strain on her health. In the summer of 1878 she was ordered to Eastbourne, and took all her children with her, going thence on a short visit to Queen Victoria. Of Eastbourne Princess Alix had golden memories of crab-fishing, bathing, and sand-castle building. There were, too, delightful games with other children on the beach, for many of the Grand Duchess Alice's friends were there with children of about the same age as hers. This was to be the last journey that Princess Alix took with her mother, and the last time that the Grand Duchess visited her own country. In November diphtheria broke out severely in the New Palace, and all the family, except Princess Ella, went down with it. The first to fall ill was Princess Victoria; Prince Ernest, his sisters, and the Grand Duke followed. Princess Alix was dangerously ill. On November 12th the Grand Duchess telegraphed to the Queen: "This is dreadful. My sweet precious Alicky so ill. The doctor at once saw that it was a severe case." At that time serum was unknown, and the old-fashioned methods of treatment were powerless against the scourge. It was the case of nature against the disease. The Queen sent her own doctor to help the German physicians. The Grand Duchess had a terribly anxious time. Several nurses were called in, but, according to her wont, when any of her family were ill, she undertook the nursing herself. She sat up whole nights with her children, going from one sick-bed to the other. All, except Princess Victoria, were desperately ill. Princess Alix always remembered calling night after night for her mother, who invariably appeared, whatever the hour, to soothe and quiet the child. In spite of all her devotion the "baby," Princess May, died on November 16th. The other children the Grand Duchess kept from the jaws of death, but her own weakened constitution could fight the infection no longer. On December 8th she fell ill in her turn, and on December 14th she died, greatly lamented, both in Hesse and in England, while to her own family her death was a shattering blow.